An Ohio puppy who had its rear legs and tail severed in a train accident is now up for adoption. The 3-month-old puppy named Trooper ruptured his left eye, and lost most of the back half of his body after being hit by a train in Hamilton, Ohio, in early March. He was taken to The Animal Friends Humane Society, where he was slowly nursed back to health. Now, after numerous surgeries and several IV pain medications, the shelter said Trooper is ready for adoption. Next week, the 3-month-old puppy will be fitted for a donated doggie wheelchair, which was donated by the Paw It Forward Foundation. 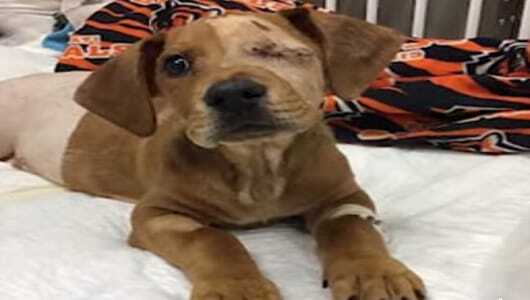 1 Response to "Puppy who had tail, legs severed in train accident now need forever home"